the fascination with analog decay that permeates the chillwave movement, that is so often a point of derision for critics of the style, has the tendency to come across as contrived, as an all-too-convenient way to mask the imperfections of the songwriting behind superficial technological imperfection. 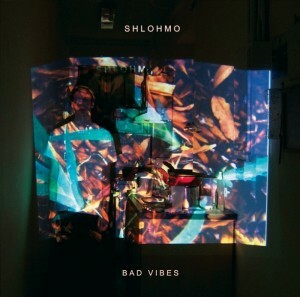 while bad vibes certainly shares a lo-fi aesthetic that might be associated with chillwave, it distinguishes itself in a crucial way: it is not just music that has been artificially made to “sound old,” but music that is derived from the imperfect nature of the medium itself (in this case, cassette tape) such that the two are inseparable from one another. the familiar elements of tape hiss, distortion, and overcompression, which might otherwise merely serve the purpose of evoking some vague notion of nostalgia, are well represented here. yet the brilliance of bad vibes is the way in which these extraneous details are represented organically, blurring the distinction between noise and music. the samples are used not only for their melodic or percussive content, but the implications of the physical space in which they were recorded. ‘big feelings’ for example opens with a recording of birds chirping while the music gradually fades in beneath it, as an image gradually being pulled into focus. it is not until the entrance of the mbira (which itself is an imitation of the bird song) and the percussion (which similarly imitates the clicks and pops of the cassette tape) that the image settles into place. the field recording is used to establish a setting, then the music springs up all around it, as if to suggest that the music was contained within these sounds all along, that it is an enhancement of the sounds of nature and not the other way around. by viewing the world through old, imperfect equipment, the music suggests two things: that nature itself is imperfect, and that there is beauty to be found in its imperfection. we live in a world that has become increasingly obsessed with the recording and cataloging of life, where nothing is transient to the point that things cease to exist if they have not been recorded. bad vibes is a reminder that despite our best efforts, nothing is actually permanent, that decay is as important a part of nature as growth, and that the two have equal potential for beauty. if ‘big feelings’ was the music of growth, its polar opposite, ‘trapped in a burning house,’ appearing at the other end of the album is the music of decay. it’s a shocking moment in an album which until this point had focused almost exclusively on memory and nostalgia to the point of willfully shutting out the present (‘anywhere but here’). ‘trapped in a burning house’ is a sudden, violent jolt back to the now, where we are forced to acknowledge not only the abstract notion of lost memory, youth, etc. but the frightening notion of our own mortality. the delicate vocals which had been present throughout much of the album are nowhere to be found here, replaced by a single voice which has been tuned so low as to be utterly incomprehensible, a wordless moan. everything in the track burns. a heavily distorted instrument, which sounds as though it may have once been a piano, alternates between two resolute, menacing chords, as a melody seemingly made up entirely of fuzz and distortion slowly winds its way out from underneath.the track is a twist ending of sorts, revealing that the album had not been a celebration of nostalgia but a representation of transience itself. as the present comes roaring back into focus we are left with no recourse but to accept and perhaps find consolation in our destruction, the house burning all the while, crumbling to pieces around us.